A pair of simple cropped trousers printed in our classic Hatley Cerise. Designed for sleeping, lounging, wearing to the beach, doing your the shopping in and generally being your favourite thing to put on. The Pyjama Trousers in our very own Hatley Rose print are a Cabbages & Roses staple from season to season. A simple drawstring front ties with a neat bow at the centre. The back waistband is elasticated for comfort. Wide legs and a super relaxed fit make them comfortable from summer to winter. 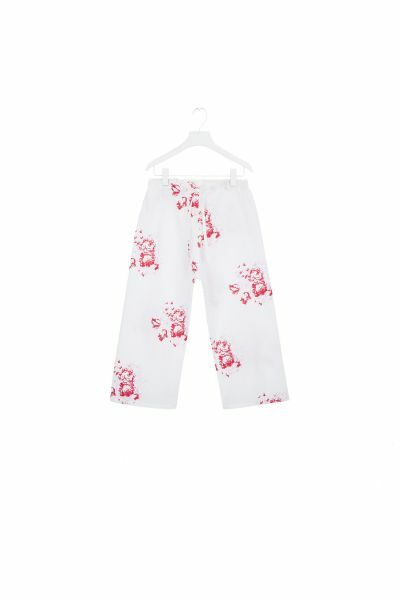 The Pyjama Trousers are made from Cabbages & Roses Hatley print in a beautiful cerise pink, printed in London. He was made in Hertfordshire. 100% Cotton.